While the majority of preterm babies survive with essential newborn care that include warmth, breastfeeding, hygiene and asepsis, and clinical monitoring, many still need more advanced facility-based clinical and supportive care. Such facility-based care for small and sick neonates has to be of high quality. Health care professionals need to seek out ways to ensure mothers and their families have access to their newborn during hospital stay, which empowers them to learn how to take care of their babies at home. This is likely to improve care seeking behavior of the families after discharge. Healthcare providers must create developmentally supportive environment that minimizes potential disruption and harms and at the same time ensures intact survival. Parents need to be regularly and adequately counselled for the care of their babies and for the need to transfer to regional hospitals when required. 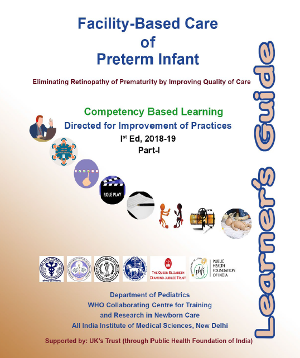 Keeping above principles of care of preterm babies in mind, AIIMS WHO–CC joined hands with Queen Elizabeth Diamond Jubilee Trust, UK and took the challenging task of developing an educational package for improving practices pertaining to facility-based care of preterm babies. This huge initiative involved team work of neonatologists and nurses working in different parts of India. Based on need assessment and focus group discussions with target users (health care professionals working in special newborn care units), the team charted out the structure and course content of the modules. 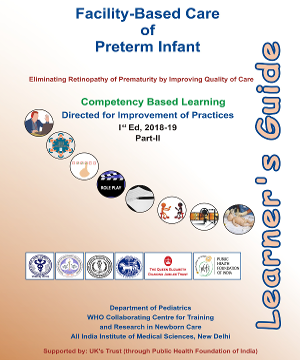 The modules are based on theory of change for quality improvement of practices for best outcomes of preterm neonates thus avoiding the dreaded "Retinopathy of Prematurity." The learning module uses participatory learning methodology using self-reading, poster demonstration, role play, videos and webinars and then knowledge self-evaluation by MCQs. The skills are then evaluated by objective structured clinical examination (OSCE) and competency-based learning administered in small groups using low cost innovative models (simulation methodology) for building team approach, improving communication and performance and enhancing psychomotor skills. The entire package is envisioned to be administered by state medical colleges to the SNCUs under their supervision via 'hub and spoke' model. Good newborn unit can thrive only if there is consensual approach, team work, rapport and mutual respect between the nurses and physicians. Consenting to follow the agreed best practices for the care of the baby always serves as a catalyst for further ideas to improve quality of care. AIIMS team is indebted to all the contributors for their outstanding efforts in providing technical inputs and creation of contents. We would like to express our appreciation to Mr Sant Lal and Mr Sahil Mehta for diligently word-processing and the formatting of the guide. Last but not the least, Mr Kurian Thomas and his team, Medical Films also needs a special mention for developing videos and webinars. A special thanks to all the babies and their families of our neonatal unit who consented for creation of the video resource material. Finally, our gratitude and thanks to PHFI, UNICEF, USAID & WHO SEARO for ongoing support in capacity building and implementation of best practices in healthcare facilities.